The Bhutanese people embody that goal as well as the nation’s explicit Buddhist traditions and philosophy. The highlight of our trip to Bhutan was a two-day overnight horse riding trek in Bumthang, which was the brainchild of one of the Wind Horse guides, Sonam Loday, who also provided us with his expert knowledge of all things Bhutanese, including Himalayan Buddhism. We went from Wind Horse’s horse farm in the Tang Valley up into the hills past small villages on an ancient trail over a mountain pass into the Jakar Valley, which was used by everyone until the recent establishment of roads to all villages. 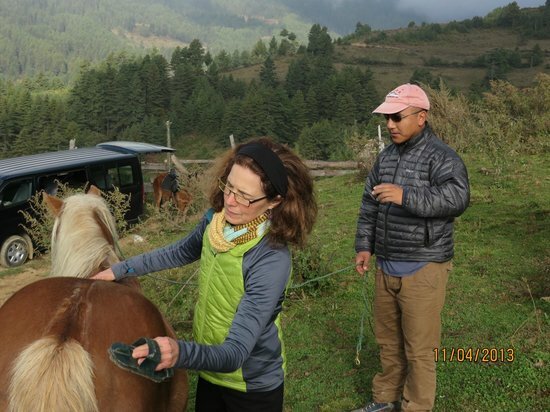 Historically, horses in Bhutan were used only by royalty, and Wind Horse is the first travel agency in the country to offer this special service to tourists. This project is also keeping these ancient trials in use while allowing tourists to participate in a world otherwise inaccessible. Our steeds were carefully selected, sure-footed and good-natured Bhutanese ponies. They worked very hard on the steep and often narrow trails. We sometimes dismounted and walked, which gave the ponies a rest and stretched our legs. We spent a night in a campsite near the Guru Rinpoche Temple, and felt that indeed, we were treated like royalty. Our tent was cozy, the food – cooked in a separate tent by our excellent horseman Pema and careful driver Sonam Tanzin, both former cooks – was delicious, and the scenery spectacular. (Our separate toilet tent was also expertly appointed.) In short, our needs were always anticipated and the experience far exceeded our expectations.